I'm impressed with my mum. She nailed that I won't bother having reunion dinner with her siblings. I asked her how did she deduce that answer. Simple. She replied that I have labeled them as trash. I believe in the goodness of people, but there are times I am harsh. I have sharp tongue, but I'm no longer afraid to speak out. My uncle and auntie invited my family for a reunion dinner on the last day of Chinese New Year. I don't look forward, but for the sake of kinship, I will bite the bullet and sail through the morbid atmosphere dinner like every other year. The news came to a shock this evening, because they demanded my family to pay for the reunion dinner given they have been paying for the past two years. My response was "FCUK THEM." I was surprised with my slippery tongue. I have never used such words in front of my mum. I don't even use them to begin with except in scrabble. I never expected my uncle to be that low. The Chinese always say we have to be magnanimous. And this is a scary sign of decay in family relationship. My mum is the most disappointed one. She spent her youth to support her two siblings and this is how her younger brother and sister treat her. I have no words to console her. I have no such medicine to stop the bleeding from a knife wound. My uncle is now a successful man in his career. What is wrong with paying back the kindness you were once given? My sister replied she can't afford to pay the reunion dinner. My auntie was lucky to not have me answering the call, for my reply will be the four letter word. Uncle and auntie can spread the news how ill-mannered I am, but God knows me better. Have you not heard of the golden thumb rule? I sometimes ponder why people change for the worse. I don't remember my uncle being such a bitter person. I used to admire him. He used to be my favourite relative. He and my auntie used to shower my sister and I with gifts. When did the distance between us began to sprout? Yes, the moment he politely said I was too stupid to get a scholarship. The moment she said I should listen to my father to decline the scholarship, perhaps it was a scam. Why would a college offer a scholarship to a stupid person like me? I often ponder deeply. What is family for when you have such type of people? My family is indeed a small unit to begin with. And with many more relatives dropping like flies. It makes me feel more of a stranger in my family tree. This year, my mum and I decided to totally close doors to all relatives for Chinese New Year. It is a disheartening decision for it's a time to reunite and exchange stories with family members from far away. It is a time to be happy and forget all the worrisome bottling in us. Yet, for my family, we do not have the luxury to have such joyful moments. We learn to forgive, but we won't forget what they had done to us. "To be happy is to be forgetful"
We will try to give way to store new happy memories ... because they are not worth even a miniscule storage space in our mind. I just got back from my Penang trip today, and am totally drained. I spent 3 days 2 nights on the island. My team members took me around Penang just to eat! I think it's more of a fattening camp rather than catching up with them. We had been eating almost after every 30 minutes. However, I managed to suggest places where we get to do exercise too - walking I mean. If not, I won't be able to wolf down my food. One of the places I revisit is the Penang Hill. Penang looks so magnificent from the peak. The last time I went there was more than 15 years ago. The landscape of Penang has changed so much since then. So is the peak. There were so much changes. I don't recognise it all now. The first craziest thing I had done during my trip is to seek fortune-telling. It's actually discourage in my religion, but I have sought for fortune-telling mid last year due to an interest of a close friend and recent events. I think I'm addicted to get my readings done. I went to one of the oldest Chinese temples and pray via the fortune-telling sticks. I had to shake it 5 times to get the right reading. Ha. The funniest thing is how fate worked. There was no one to explain about the reading within the temple. I walked out of the temple to meet up with my friends, and somehow one of the shopkeepers saw me walking around with my lost expression. He offered to read for me. I found the reading interesting and consistent with a few fortune teller's reading. The second craziest thing is my friends took me to clubbing with some other friends until 3.30 am. During our supper, there was a celebrity sitting in front of me. My friend was encouraging me to get his autograph, but I wasn't keen at all. Coz I don't like him. HAHA. Anyways, that night I met some very important people who kept low profiles. They are very friendly and one heck sporting. So why need the celebrity's autograph? It's a pity Jolenesiah and I could not hang out due to her busy schedule. I only managed to drop by to say hi. I managed to achieve something in this trip. That is to eat banana fritters ala Chinese style. I have been wanting to eat that for 10 years! No joke! The last time I ate was 16. And the times I went back to Penang, I didn't have the chance to hunt for it. Let just say these operators don't have second generation to take over their business. Although I lose a lot sleep during the trip, the most important thing is I managed to have fun with friends. That is the mission of my Penang trip. I am proud to say MISSION ACCOMPLISHED! I slept like a baby! Regardless of how exhausted I were I was still on alert mode in waking up to my designated time at 5 am. 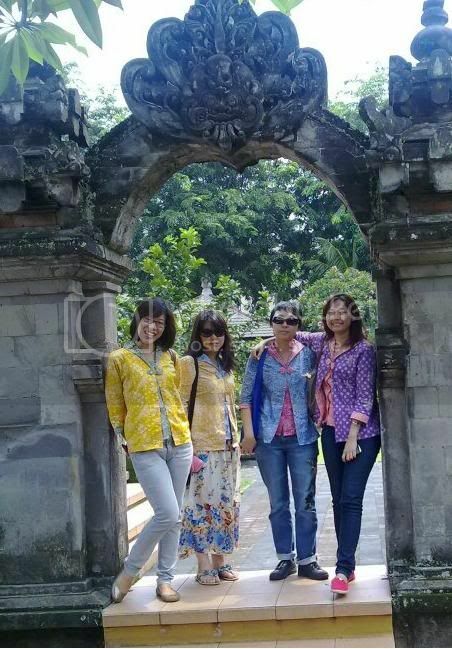 In the afternoon, my host parents took us to Taman Mini for a view of the traditional houses of Indonesia. One of my homestay buddies suggested the Bali theme since it's architecture designs are different from the rest. We met a lot of PYs there with their host family! Happy we were! Tidbits: Eh? How come I don't look impress? Most probably I was closing my eyes while taking this photo. HAHA. I on the other hand were wondering what kind of house we are going to stay for the next few days for the address reveals it's located in some kind of village. A village indeed. The route to the house was sooooo in that I could just lose my way if I were to drive on my own. And then O.M.G. was all the girls expression... because it looks like we just entered some WONDERLAND!! The house is decorated with lots of butterflies and lighting, thus making us feel like we are in some shopping mall gearing up for Christmas! We entered the house excitedly. It's an old renovated wooden house with a theme antiquity meets modernisation. I felt like I was in some kind of eco-nature chalet. When we enter one of the rooms, we saw four teddy bears sitting on the chair awaiting us! There was another round O.M.G from the girls. I could not resist its cuteness so I immediately hug one closely to my chest with a broad smile. It's a gift from our host father! One of the girls placed her scarf around the teddy, and we all followed suit. Spinoff: My host mum later also gave us pyjamas and slippers. I was so thrilled! Thank you god for giving me such wonderful host family! Yes, we all brought scarf along because it's part of our uniform. My SG's institutional visit is to the Brunei Times. I had a great time exploring the centre. I can really feel the enthusiasm and the passion of the staff there as they talked through their roles and responsibilities to the PYs. I found a very interesting picture. That is so ME. What do you think? It is so ME, right? Hehe. Yes, I am indeed imposing my belief on you! Later, the Brunei Times interviewed me and my SG team leader. I appeared in the paper! Check it out here. Spinoff: No idea why I don't have the luck of appearing in local dailies. This is not the first time. It's always!!! ARGHH!! YES!!! I finally able to finish crafting a letter for my penfriend from Italy. That is after 2 attempts within one month. I kept on changing the content as I wrote according to the events happened on the ship. But it is still an accomplished mission since she has already been waiting for my reply for almost a year. I was determined to reply her using Japanese stamps because I promised her a surprise on Facebook. I also thought writing to her on the ship and about the ship will be interesting apart from writing away our daily lives. I really regret that I didn't capture a picture of myself penning the letter on the deck for her to see. That would be interesting and a moment to remember. Oh yes, I sat on the deck to write to her. The scene is beautiful ... but a little glaring so I was wearing my sunshades while writing. HAHA. I'm sure that would bring smile to Valentine. The stamp cost me 110 Yen. I didn't bring 10 Yen, but the postmaster was kind enough to pay the balance for me. I was in a hurry to attend the Vietnamese contingent's cultural performance tonight, so I just use my saliva to paste the stamp, despite of the postmaster's insistence of using water. The only thing I really forget to put on the envelope is Fuji Maru's chop! Spinoff: My very action of dabbing the stamp on my tongue in front of the postmaster sent the administrator announcing the following morning in the assembly to USE WATER NOT SALIVA for pasting stamps.